TBA: Fall Fifteen | Tunes. Beats. Awesome. U of T’s Tunes. Beats. Awesome. welcomes you to the beginning of their 15th season! 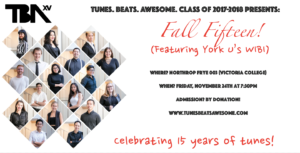 With a new year comes a new fall concert, filled with exciting tunes from yours truly. TBA is once again on the road to the International Championship of Collegiate A Cappella – but before we do, we would like the opportunity to show you what we’re made of this year. We will be joined by York University’s very own WIBI, so it will surely prove to be an electrifying spectacle! Admission is PWYC, but donations are always welcomed and encouraged as TBA prepares for the 2018 ICCA!